Buh bye GPS: the Google Maps Navigation Beta is adding traffic re-routing to its free Android app today, further sounding the death knell of traditional (and not free) in-car GPS systems. Previously Google Maps Navigation would take the “fastest” route and set up alternate routes like ones that use highways instead of side roads. As of today all you have to do (aside from buy an Android phone) is open up the Navigation app. 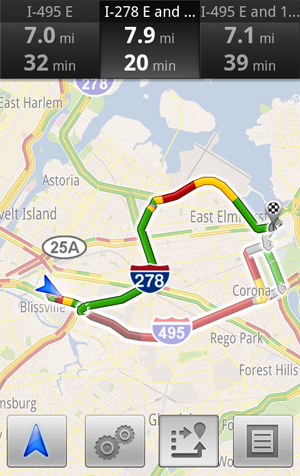 The app itself will use realtime traffic data crowd-sourced from users to try to get you there sooner. No guarantees. The functionality is available in North America and Europe, where the realtime traffic condition data is currently available.